Water is scarce because it is badly managed. “THOUSANDS have lived without love; not one without water,” observed W.H. Auden. He omitted to add that, as with love, many people have a strong moral aversion to paying for the life-sustaining liquid. Some feel that water is a right, and should therefore be free. Others lobby governments to subsidise its distribution to favoured groups. All this results in vast and preventable waste. Water covers two-thirds of the Earth’s surface. It is not used up when consumed: it just keeps circulating. So why do researchers from MIT predict that by the middle of the century, more than half of humanity will live in water-stressed areas, where people are extracting unsustainable amounts from available freshwater sources? One reason is that as the world’s population grows larger and richer, it uses more water. Another is climate change, which accelerates hydrologic cycles, making wet places wetter and dry places drier. 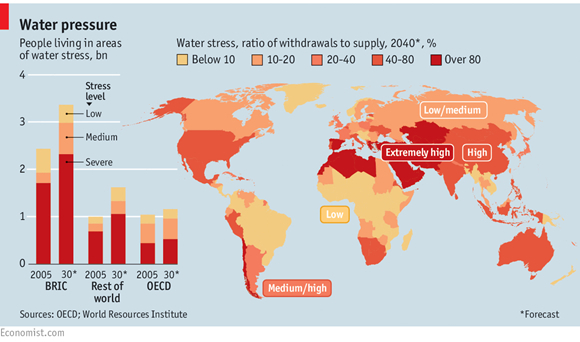 The World Resources Institute, a think-tank, ranked 167 countries, and found that 33 face extremely high water stress by 2040 (see map). But a lot of the problem stems from lousy water management, and that is something the officials who meet in dusty Marrakesh this week for the next round of annual UN climate talks should ponder. A crucial part of adapting to a warmer world is to work out how to allocate water more efficiently (see article). Each person needs to drink only a few litres a day, but it takes hundreds of litres to grow food—and thousands to put a joint of beef or pork on the table. Farming accounts for 70% of water withdrawals and industry accounts for most of the rest. Because farmers and factory bosses are politically powerful, they typically pay far too little for their water. Some pay for the operational costs of supplying it, but not the infrastructure that enabled it to flow from the tap. Many pay nothing to raid underground aquifers—India pumps two-thirds of its irrigation-water this way. When something is too cheap, people squander it. Chinese industry uses ten times more water per unit of production than the average in rich countries, for example. Farmers in parched places like California grow thirsty cash crops such as avocados, which could easily be imported from somewhere wetter. The key to managing water better is to price it properly, giving consumers a reason not to waste it and investors an incentive to build infrastructure to supply it. Vast sums are needed: over $26trn between 2010 and 2030, by one estimate. Before water can be properly priced, however, it needs to be clear who owns it (or, more precisely, who has the right to extract how much from rivers, aquifers and so on). Australia has led the way in creating such a system of tradable water rights. The aim is to ensure that water winds its way to those who can make the best use of it. Calculating how much is being used, and how much actually ought to be used, is essential. In Australia old rights (typically belonging to landowners) were replaced with shares in perpetuity that grant holders a proportion of any annual allocations. This means that the only way one person can have more of the liquid is if another person has less. Two markets have emerged: one in which seasonal allocations of available water can be traded, and another in which shares themselves can be. For the system to work, extra care should be taken to ensure that tradable water rights are allocated in a fair and open way. The “block chain”, a cryptographic technology that allows strangers to make fiddle-proof records of who owns what, could help.